Set of 12! Modern Home is proud to offer an original classic done right. Mule drinks have taken over the country's most popular watering holes and the only proper way to serve these refreshing cocktails is in a 100% copper mug. With rising costs of copper, many manufacturers have resorted to using stainless steel and spraying imitation mugs with copper finish. The Modern Home Moscow Mule mug is comprised of a vessel that is 100% copper. No additives, no coatings, only copper. Finished with a brass handle, our mule mugs are entirely hand made in India. Whether given as a gift or used for dinner parties, these Moscow mule mugs are sure to be a great conversation piece.Created in 1947 by a vodka aficionado and ginger beer importer, the Moscow Mule has long been a beloved cocktail traditionally served in a copper mug. 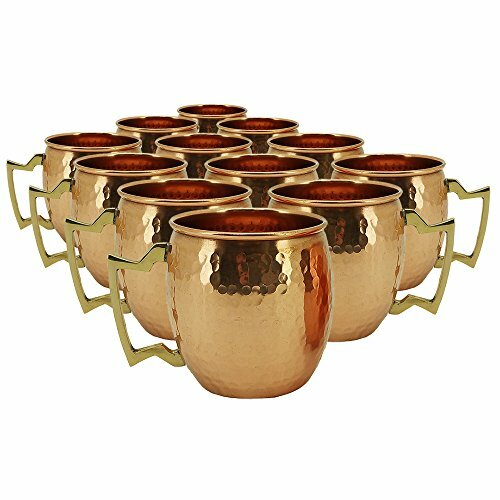 The 'Moscow Mule' is traditionally served in solid copper mugs. The most scientific benefit of using copper Moscow mule mugs is temperature. For centuries, the best drinkers have known that chilled drinks in copper cups offer an extra-cool sensation, due to the metal quickly taking on the icy temperature of the cocktail. The rim of the mug becomes chilly almost instantly, offering a frozen sensation on your lips. The cold metal is highly effective at insulating the cold temperature of any liquid, especially good for summertime drinking, and deflecting heat from the sun. The handle of the mug helps maintain drink temperature, as well, keeping the near 100 degree body heat of your hand away from the walls of the mug, and your Moscow Mule safely chilled inside. This high-quality mug is handcrafted from solid copper. Each piece is unique just for you! Each Copper beer mug measures 3.5" in diameter and 3.75" tall and holds 550ml (18 ounces) of your favorite mule. Included with each order is our own mule recipe guide featuring a variety of mule variations. If you have any questions about this product by Modernhome, contact us by completing and submitting the form below. If you are looking for a specif part number, please include it with your message.